Well-known as Tegalalang Rice Terraces, Ceking rice terraces is famous nature scenes of rice paddies involving Subak ( traditional irrigation system) near Ubud. 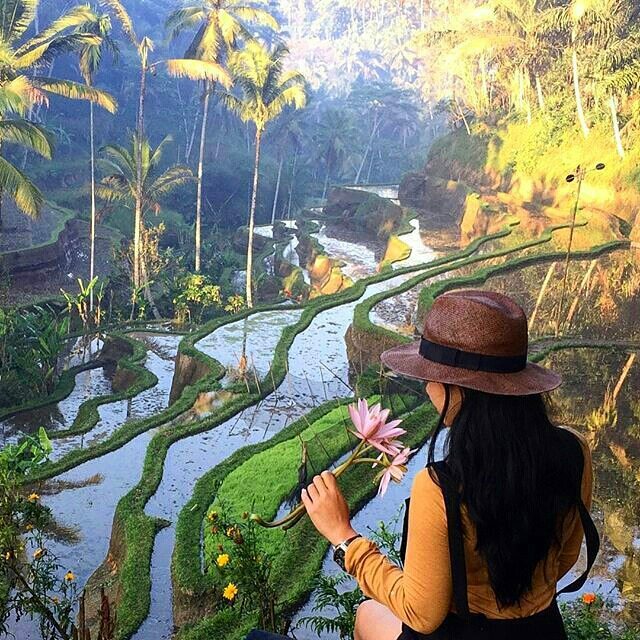 Ceking rice terraces is a “Must to Visit in Ubud” for your bucketlist. This place offer a perfect Bali natural view as your memorable picture while you explore Ubud. Campuhan become famous place to visit and enjoy natural greeny view in heart of Ubud. This place also have mesmerizing view for Sunset and Sunrise. The location at Jalan Raya Ubud No.35, Ubud, Kec. Gianyar, Bali. Goa rang reng is Beautiful Naturall falls, with fresh and clean water. It is good place for purification because there are holy cave at the top of rapids waterfall. To be able enjoy this place you must bring Canang or buy in the parking area because Rang Reng Cave is sacred area. Goa Rang Reng Waterfalls located at Banjar Gitgit, Desa bakbakan. Tegenungan has Natural beauty falls for its Beautiful Sunrise View. This place is tourist popular place in Bali. Tegenungan waterfall located in Desa Tegenungan, about 5 kilometres, south east Ubud. Watching the monkeys is amazing experience you have in this sacred place. It is a must to visit place in Ubud. Located in Jl. Monkey Forest, Ubud, Bali. There’s even a temple inside the forest where people go to worship. Furthermore, it is an important spot for research and conservation programs. Goa Gajah or “Elephant Cave” is a “Must to see” historical site in Ubud. Located on western edge of Desa Bedulu, Kec. Blahbatuh, Gianyar, about 6 kilometres out of center Ubud. The word of Goa Gajah’s coming from the word of Lwa Gajah, the name of spiritual temple for meditation in 11thcentury. You won’t find pachyderms here. The complex is open daily 08:00-16:00. Saraswati Water Palace, locals called as Pura Taman Saraswati. This sacred temple located on right in the heart of Ubud, Gianyar. The carvings on this temple is a honor to Dewi Saraswati, the Goddess of Knowledge and arts in Hinduism believes.